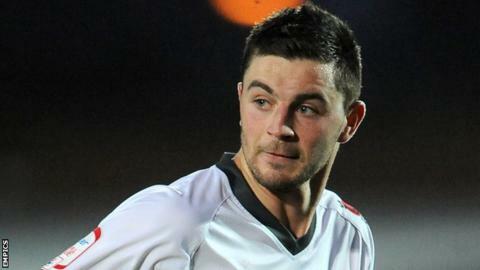 Padraig Amond scored his 24th league goal of the season to help Grimsby Town to victory against Woking. Jon-Paul Pittman latched onto Andy Monkhouse's header to put Grimsby ahead but Giuseppe Sole headed Bruno Andrade's free kick to equalise. Amond struck his first of the night when he headed in Evan Horwood's cross and added to his tally soon after. Just before half-time, Amond struck from 25 yards out to make sure of all three points for the hosts. "Three good goals. I thought they were good play and we've had a goal disallowed, plus a couple cleared off the line. "You just think is it going to be one of them nights and things going against you, but overall second-half I thought we were relatively comfortable. "It keeps us that bit of a cushion at the minute. But there are a lot of teams still interested in the play-offs." Match ends, Grimsby Town 3, Woking 1. Second Half ends, Grimsby Town 3, Woking 1. Ryan Jennings (Grimsby Town) is shown the yellow card for a bad foul. Foul by Ryan Jennings (Grimsby Town). Godfrey Poku (Woking) wins a free kick. Substitution, Grimsby Town. Ryan Jennings replaces Padraig Amond. Substitution, Woking. Cameron Norman replaces Joey Jones. Attempt missed. Omar Bogle (Grimsby Town) right footed shot from outside the box is too high. Substitution, Woking. Joe Quigley replaces Giuseppe Sole. Offside, Grimsby Town. Andy Monkhouse tries a through ball, but Andy Monkhouse is caught offside. Attempt saved. Shaun Pearson (Grimsby Town) header from the centre of the box is saved. Attempt saved. Andy Monkhouse (Grimsby Town) left footed shot from outside the box is saved. Attempt saved. Padraig Amond (Grimsby Town) left footed shot from the centre of the box is saved. Attempt missed. Matt Robinson (Woking) header from the left side of the box is too high. Assisted by Bruno Andrade with a cross. Second Half begins Grimsby Town 3, Woking 1. First Half ends, Grimsby Town 3, Woking 1. Attempt blocked. Alex Smith (Woking) right footed shot from the centre of the box is blocked. Offside, Woking. Alex Smith tries a through ball, but Alex Smith is caught offside. Attempt blocked. Giuseppe Sole (Woking) right footed shot from the right side of the box is blocked.